Established in 1994, Cavalry tank museum is a unique museum that displays vintage armored fighting vehicles. The museum has a collection of more than 50 such vehicles on display, with the oldest one being the silver Ghost Rolls Royce armored vehicle. Many of these vintage vehicles date back to first and second world war. The huge battle bunkers that have withstood wars are quite impressive and awe-inspiring. The place also displays photos of brave soldiers and the honors won by them during the war time. The place is well-maintained and the vehicles are well looked after. The campus of the museum is large, covered in lush greenery. A unique place in all of Asia, this museum commands a visit when you are in the neighbourhood. Love this? Explore the entire list of places to visit in Ahmednagar before you plan your trip. Fancy a good night's sleep after a tiring day? Check out where to stay in Ahmednagar and book an accommodation of your choice. Nicely maintained museum. The person who gave us a guided tour of the museum was excellent. Though he is a retired navy personnel and has joined recently the cavalry tank museum, yet he gave us detailed information about the exhibits. A must see museum. This museum needs to be included in the list of places of tourists' attraction in Ahmednagar by the tourism department..
Monday closed. A great place to visit. Opens for public from 9 am to 5 pm. More than 50 types of tanks are there. This is the only tank museum in Asia. You can also see tanks of other countries in this museum. My understanding is tanks of even rivalry countries seized in war have been showcased here. It has provision of tea, coffee and cold drinks. The actual museum starts around one km inside the main gate. You may take a note of this while fixing transportation to here. Autorikshaws are allowed to drop you inside by depositing their ID cards as per regular army campus convention. Have a proud visit. 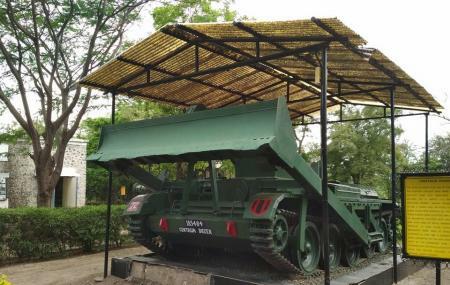 The only cavalry tank museum in Asia is located at Ahmednagar in Maharashtra. Displays many tanks used in various wars and conflicts by different countries. Also has three memory Halls to showcase the proud history of Indian army and its brave troops. Ticket is 20 rs. No parking charges. Also has a canteen and a garden.